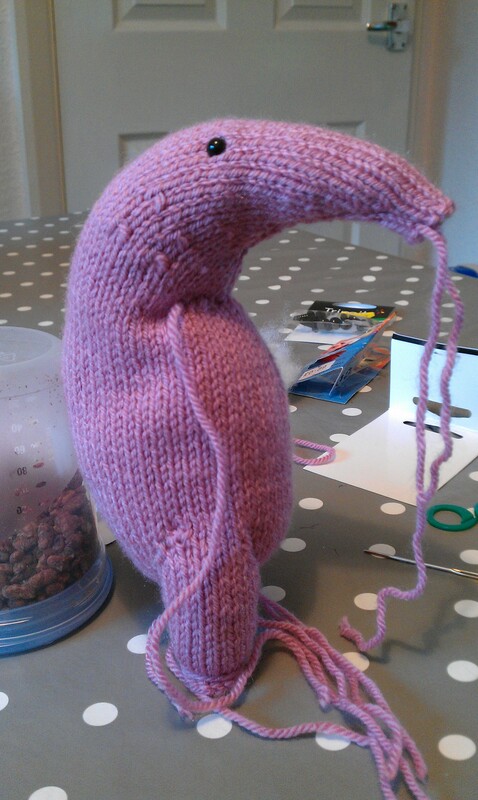 Work on the Clanger has stalled, and it’s currently looking like a rather strange pink penguin. 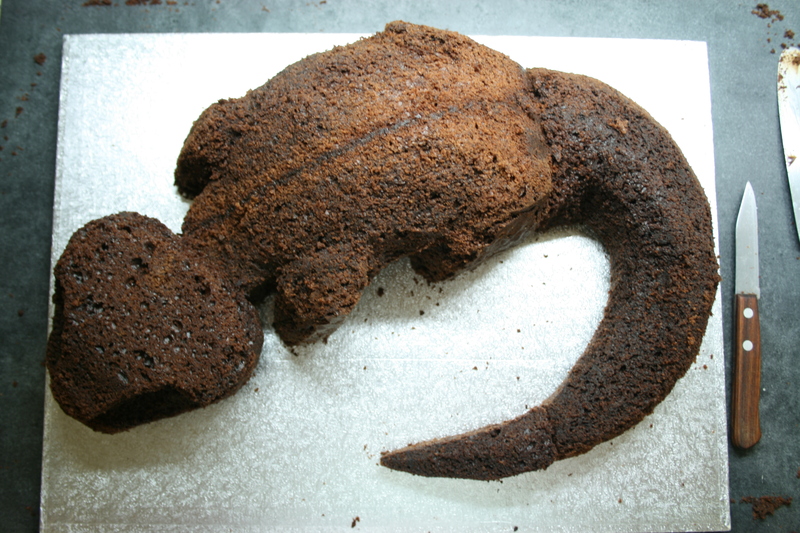 Instead, I have been working on the annual cake-creation for the Pumpkin’s birthday. 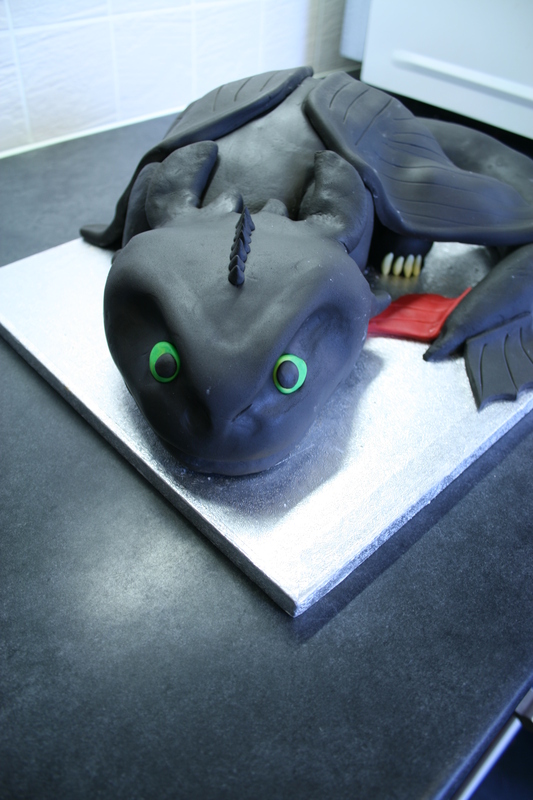 He’s been very into ‘Dragons: Riders of Berk’ on CBBC recently, which is part of the same franchise as the ‘How to Train Your Dragon’ films, so he decided a couple of months ago that he wanted his party to be themed along those lines, including and especially, his cake. A quick scan of google images and Pinterest showed me many rather impressive creations, and some less successful ones! 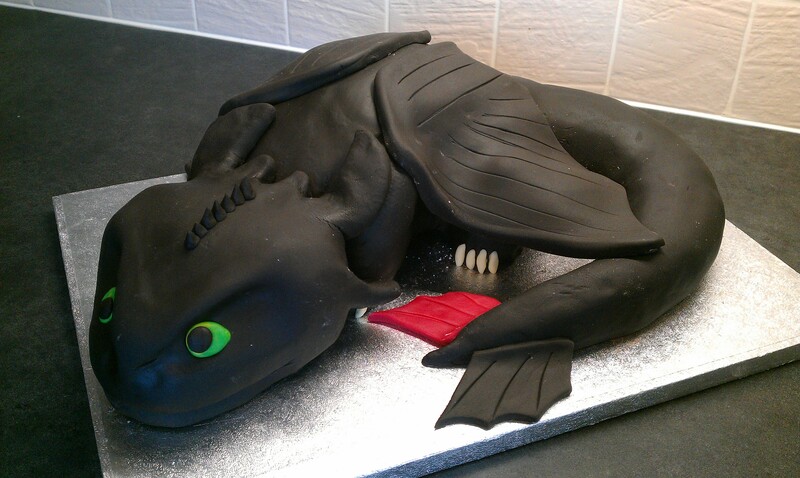 Fortunately, some kind person has made an excellent Youtube tutorial, demonstrating exactly how to go about making Toothless in cake form. 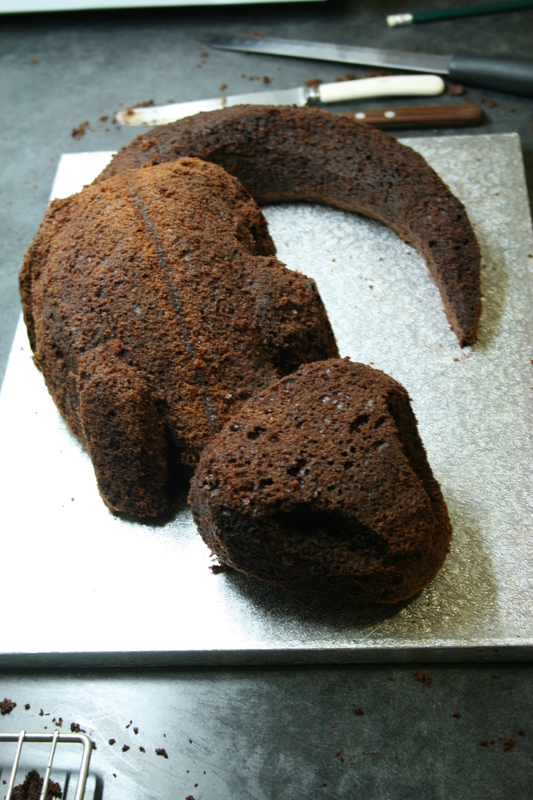 I started with two large chocolate mud cakes (recipe here) and glued them together with chocolate ganache (recipe here). 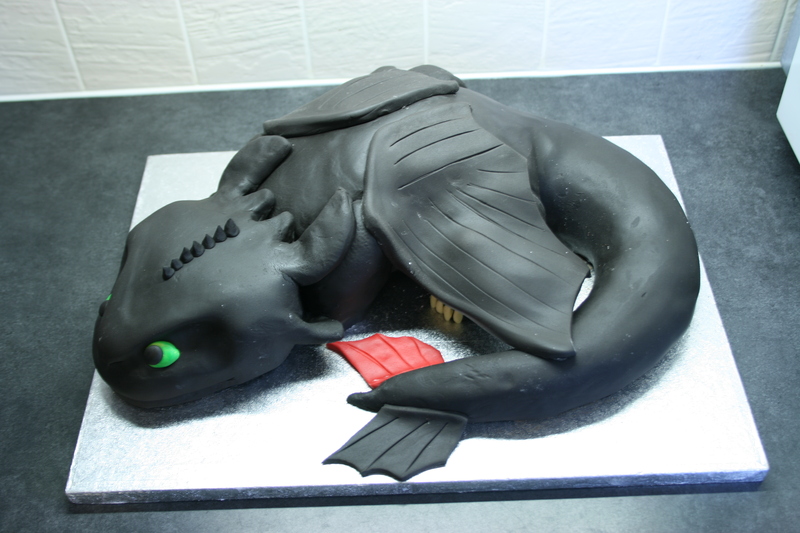 I’ve never carved a cake before, but once I got started, and with the tutorial for reference, it was actually alot easier than I expected it to be, and really quite satisfying seeing the dragon shape emerge. 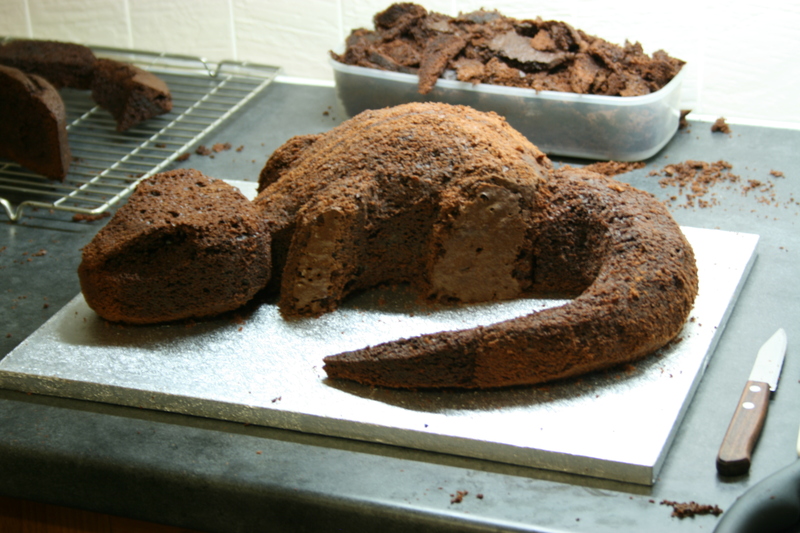 Once the basic shape was there he was covered in ganache and left to chill out in the fridge overnight. 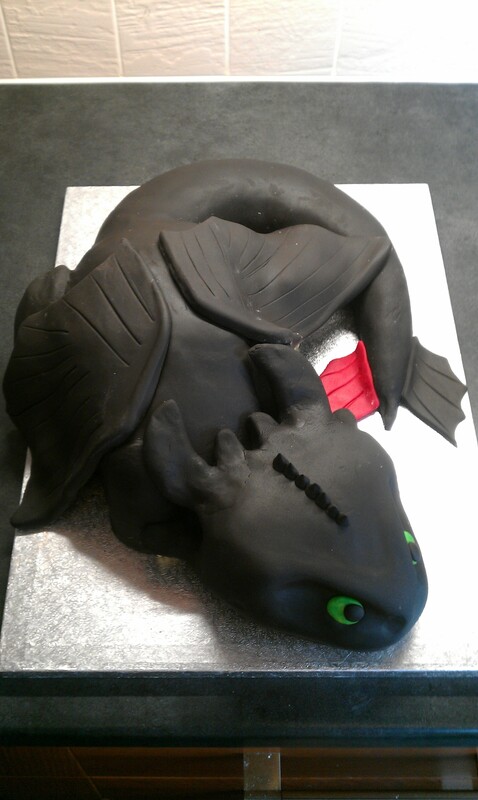 Covering him in fondant was more of a challenge. 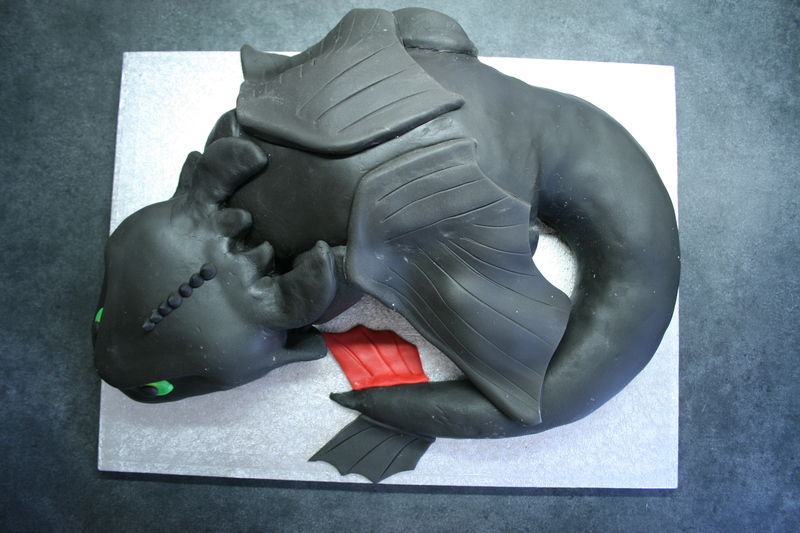 I started out trying to cover him using as few pieces of fondant as possible, but it was really hard to roll out a 2D shape that was the right size and shape to cover a 3D cake. 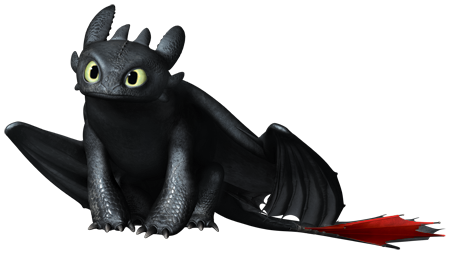 I tried to cover the whole tail in one piece a couple of times, but ended up doing it in 2 pieces. Once I realised that actually it was possible to blend the two pieces so you couldn’t even see where the join was, the whole thing became much easier and far less daunting to do. I think I used 3 pieces to cover the body in the end, and did most of the legs separately. The head was all done in one go though, including his ears and horns at the back of his head. 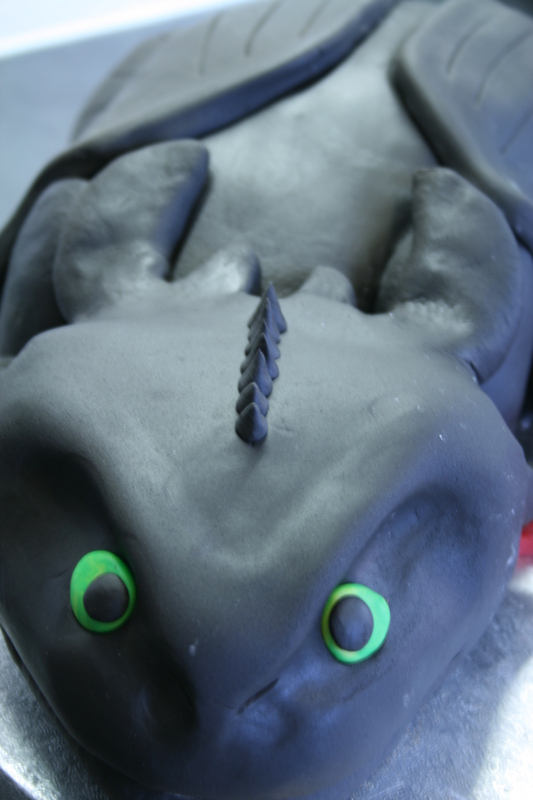 Once the black icing was on, he only needed a few small extra details – eyes, claws, spines, tail fins and wings, and he was all done! I would have liked him to have a bit more texture to his skin, but there was no easy way to do it, so he stayed smooth-skinned. 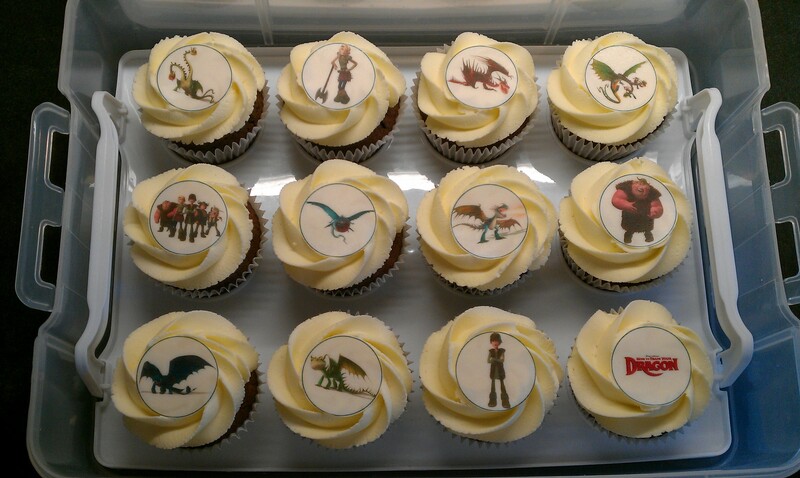 I also made some cupcakes with printed toppers of other characters from the show, which complemented the cake nicely. I received some lovely compliments from the grown-ups at the party, including a near-commission. 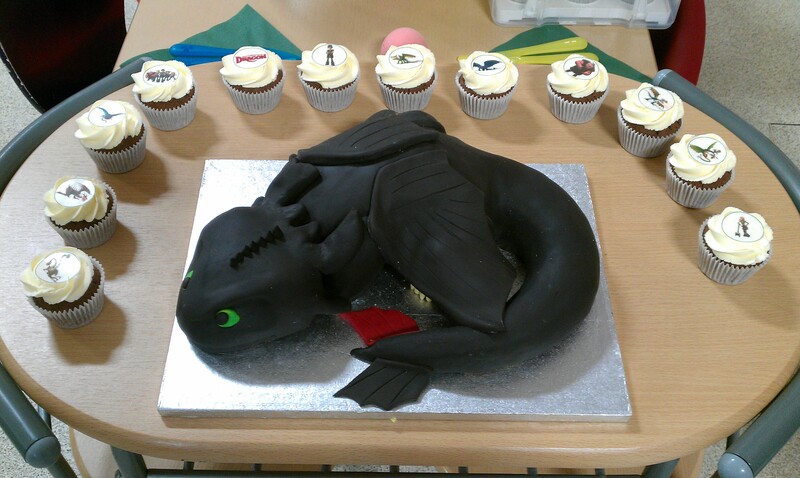 The cupcakes went down well with kids and adults alike, and the kids mostly knew who the cake was meant to be! But the best moment was seeing the look on Pumpkin’s face when I held his hand and brought him to see the cake laid out on the table. He happily went round telling everyone that ‘Mummy said she couldn’t make a cake like that, but she did it!’ If that’s not the best kind of encouragement for trying something new and challenging, I don’t know what is!? Well, that was faster than I expected! 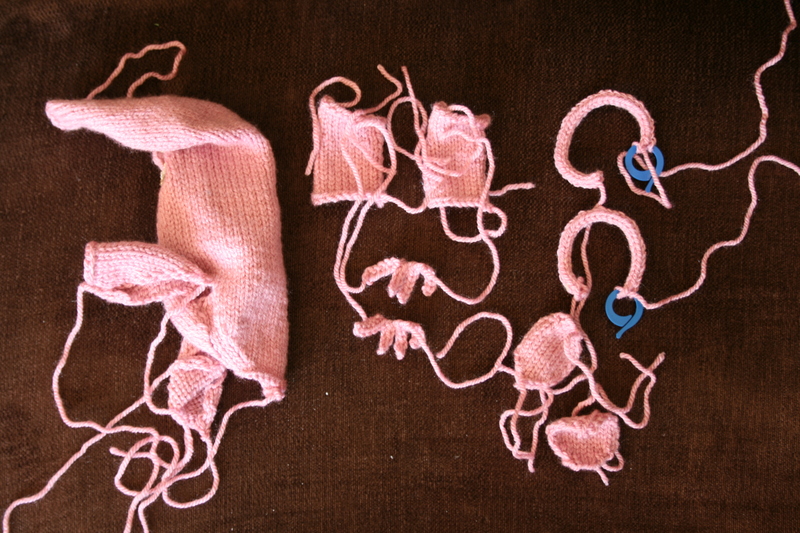 I already have all of the knitted components of Pumpkin’s Clanger all made up and laid out. Look! One head/body/legs, two arms, two sets of fingers, two ears and 2 ear-edgings. It’s the first time I’ve knitted something with so much shaping, including short rows, and the first time I’ve done i-cord, but each piece is so small, they just dropped off my needles in no time! I ventured into town this afternoon to buy all of the felt and other components I need to finish making up Tiny Clanger, and in doing so, discovered that sadly my local yarn/fabric/haberdashery shop is closing at the end of this month. *sadface* Fortunately, a new fabric shop has recently opened in town (though perhaps that contributed to the old one closing…), and since the old shop didn’t have what I needed anyway, I spent my pennies in the new one. I think I will have to return for some bargains before the end of the month though. Lots of the Clanger projects I’ve seen on Ravelry say that the sewing up is what takes a long time, but hopefully I’ll have a finished Clanger before too much longer. Then maybe I’ll make a second one for Pickle too.